Kolkata-based model Dimpy Ganguly has walked out of her four-month-old marriage to Rahul Mahajan, son of BJP leader Pramod Mahajan, alleging domestic violence. Dimpy had married Rahul with much fanfare on the NDTV Imagine's reality show Rahul Dulhaniya Le Jayega in March this year. "Rahul beat me up early on Thursday morning after waking me up to know the contents of a message that had beeped on my phone. When I asked him to go back to sleep, he flew into a rage and began hitting me. He punched, kicked and dragged me by hair," the 22-year-old model told a TV channel. Rahul could not be reached over phone for his comments. This is the second time that Rahul, who was also involved in a drug abuse case, has been accused of domestic violence. His first wife Shweta Singh, who was his childhood friend, had accused him of physically abusing her. The couple got divorced in 2008 after which Rahul participated in Colors' reality show Big Boss. He continued to be in the limelight for his closeness with co-contestants Monica Bedi and Payal Rohatgi. Incidentally, Rohatgi too has alleged harassment by Rahul, saying he has been calling her asking for a second chance. "I just don't want to be harassed anymore. That's about it. I don't want to speak to him. He is a married guy," Rohatgi said. 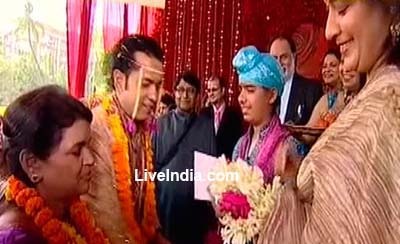 Senior BJP leader Pratap Ashar, a close associate of Pramod Mahajan who was present at the live wedding function of Rahul and Dimpy, refused to be drawn into the controversy saying that he did not know anything. She said, "Me and Rahul, we've just had a conversation. He regrets sincerely and we're both very upset. As for now, I’m extremely hurt and I need sometime alone to recover and think about it." Dimpy spoke out after visiting Rahul's apartment. Rahul has still not spoken to any media about the incident. 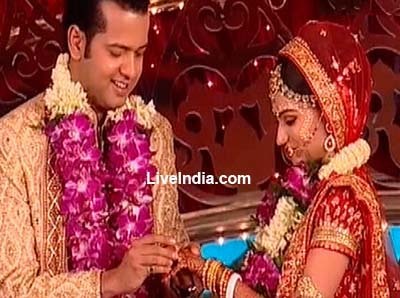 The couple tied the knot live on Imagine TV's reality show, 'Rahul Dulhaniya Le Jayenge' in March. 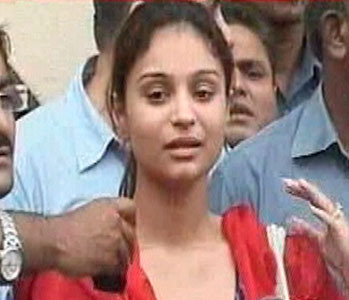 According to reports, Dimpy left Rahul`s residence in Worli after she was allegedly beaten up by him. It should be noted that Rahul’s first wife Shweta Singh had also accused him of being physically and mentally abusive. 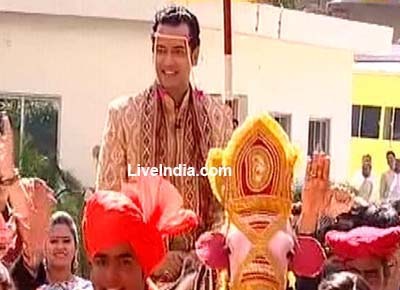 Finally, the D-day arrived for Rahul Mahajan who has been bride-hunting since a month in Udaipur. 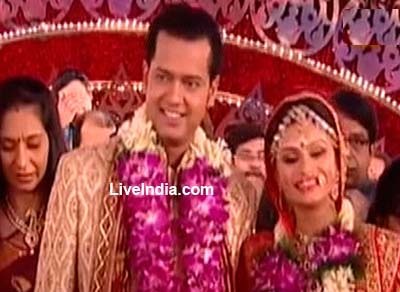 The finale of Rahul ka swayamwar today culminated in Rahul exchanging marriage vows with 21 years Dimpy Ganguly. The swayamwar which started with 15 wannabes trying their every bit to impress Mr. Rahul Mahajan to become Mrs. Mahajan saw its last episode today with Harpreet, Nikunj and Dimpy fighting out the last battle. But it was the young Bengali model dimpled-Dimpy who took away the heart of the son of Late politician Promod Mahajan. Rahul was accompanied by him mother and some close friends but his sister was conspicuous by her absence. 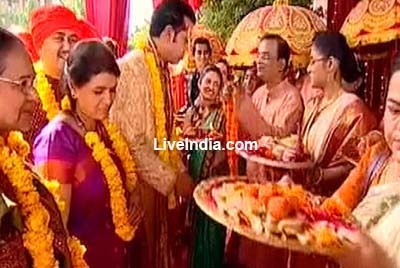 This is Rahul’s second marriage after he broke his marriage with his first wife Shweta who was his childhood friend. Rahul ka swayamwar, reality show on Ndtv imagine has garnered all the attention in the form of criticism for its poor and unrealistic concept of choosing one’s life partner on TV. The 34-year old has even been compared to a joker because of his weird antics and not-so-funny laugh on the show. 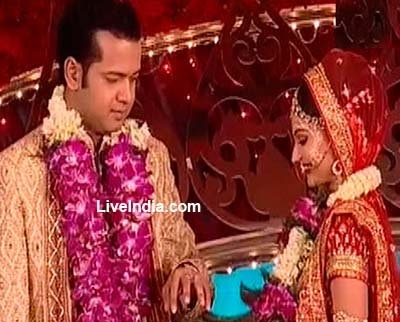 With only a few hours left for Rahul Mahajan to finalize his bride, there is strong buzz that Dimpy Ganguly is the girl he will choose. "I am very excited yet nervous at the same time. I am really looking forward to the results," said Dimpy in her last interaction with the media. But our source from the ongoing Lakme Fashion Week in Mumbai reveals, “Dimpy is more than confident that she will be Rahul’s bride and has already sent invitation to family and friends asking them to be present at the venue”. The source also adds, “I am amongst Dimpy’s invitees for the wedding and am making my preparations for the big night”. In fact so strong is the chemistry between Rahul and Dimpy that apparently co-contender Nikunj Malik wanted to quit the show few days back. Nikunj did not like the fact that Rahul was getting close to Dimpy and could not see this happening before her eyes. “ Mera to vishwas hi dagmaga gaya (my trust has shaken)”, she was last heard saying. The third girl Harpreet Chhabbra, a 21-year-old model and anchor, is nervous and merely says "I hope Rahul's decision is in my favour." The girls have wooed Rahul in every possible way during the show, leaving behind 14 contestants. Over 16,500 women applied to be on the show. The wedding will take place in a luxurious suburban hotel in Mumbai where the who's who of society will grace the occasion to shower their blessings on the couple. Ace designers Vikram Phadnis, Neeta Lulla and Ashley Rebello will dress up Rahul's brides-to-be. Rahul, who ended his marriage with childhood friend Shweta Singh in 2008, has planned to go to the Maldives and Ireland for his honeymoon, if a court which is holding his passport allows him to do so. He is facing charges of using banned drugs. After the marriage an ecstatic Mrs. Dimpy Mahajan said that they both shared a better chemistry and also being a known face in her city Kolkata, she could handle the media better than other contestants on the show. What should be the Punishment of Pravin mahajan. 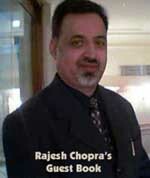 Rajesh Chopra. LiveIndia.com 04.05.2006 Delhi.